British Columbia is a land filled with rivers, cascading waterfalls, and spectacular forested mountain ranges, but it also has something else that it is famous for salmon fishing. People come to watch the salmon run every year, but what’s the fun in that? Grab your pole and get in on the action at a British Columbia fishing lodge. Salmon are special because they spend part of their lives in freshwater and part of their lives in the saltwater of the ocean. There are five species of salmon in the Pacific Ocean, but only one in the Atlantic. Each of these five species of Pacific salmon has their own unique mating, hunting, and personality characteristics. The annual salmon run is part of the salmon’s life cycle. Understanding a salmon’s life cycle will help you know when to catch them. During mating season the females lay eggs in nests called redds. The males fertilize the eggs, which remain in the gravel throughout the entire winter. In the spring, the embryos develop and hatch into baby fish called alevins. They stay close to the nest and live off the yolk sack attached to their bellies for a few months. Once the yolk sac is consumed, they emerge from the gravel and are now considered fry. The fry fills their swim bladders with oxygen from the surface of the water and begins to feed. Their survival depends on access to shelter, shade, and side channels that allow them to hide from predators. They remain in the stream of their birth for varying lengths of time, depending on species. The only exception is pink and chum salmon, which swim directly for the sea as soon as they emerge as fry. Sockeye salmon tend to first migrate towards a lake and then move on to the sea after one or two years. Coho tends to spend over a year, but Chinook fry only spend about 5 months in a freshwater environment. Environmental cues tell the fry to migrate to the sea. During this stage, they are called developing smolts. They migrate at night to avoid predators, allowing the river to carry tail first downstream in the current. Larger smolts may swim to the ocean. They stop at estuaries near the river mouth and allow their bodies to adjust to the saltwater. During this time, they feed heavily. What Causes the Salmon Run? Once the salmon make it to the ocean, some will stay near the coast, while others head northward towards fertile feeding grounds. Some species have a rigid schedule about the amount of time they spend in the ocean growing. 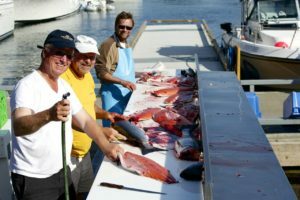 Coho typically spend four to seven years at sea. Pink salmon spend exactly 18 months before heading inland to breed, whereas sockeye spend almost exactly two years. Chinook spend the longest time growing to an enormous size for nearly eight years. After the salmon have spent their time at sea, an unknown drive will cause them return to the exact stream, and many times to the exact nest, where they were born. What causes this is not understood, but this migration occurs yearly, with the fish that are ready to spawn returning to their home rivers. The journey is very tiring and they use their stored fat, and other body tissues, all except the reproductive organs. This is an exciting time for salmon fishing BC rivers. During this migration several physical changes take place. The males develop a hooked nose used for fighting other males. The females make nests as soon as they reach their natal streams. The males fight for the rights to a female. The dominant male will enter into a type of courtship ritual. The female releases the eggs and the male releases the mitt at the exact same time. The eggs float downward to the gravel where the female covers them. The female then moves upstream to make another redd. The cycle continues until both the males and female die. Dent Island is a premier British Columbia fishing lodge located in the heart of the action. Five species of salmon spawn near the lodge. Some Chinook, called Tyee, can grow to over 30 pounds. May through September is salmon run time at the Lodge, creating excellent opportunities for anglers of all types. 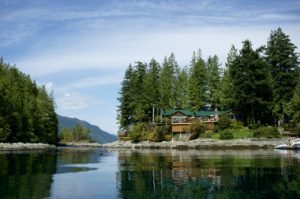 Dent Island Lodge offers both saltwater and river salmon fishing. Salmon fishing BC rivers are a challenge for anglers because salmon are known for putting up a fight. Landing one is a well-earned prize, particularly if it is a Tyee-Chinook. Make your plans to visit the beautiful Dent Island Lodge and catch some of the action yourself during this year’s salmon run. Fireplace, chess, a variety of board games, satellite TV and a view of the harbour moorage are lounge features. Aside from a spectacular view of Cordero Strait, our gym also offers all new state of art equipment including two treadmills, stationary bike, elliptical trainer, stair climber, free weights, mats and a mirrored wall. Located near the exercise gym. Named Tugboat Trail, is a good 20 minutes hike not suitable for sandals! Are always available in the Lodge. From May thru September, we're privileged hosts to 5 species of salmon including Coho, Pink, Chum and the mighty Tyee - Chinook salmon of 30 lbs or more. Let us know your BC fishing preference and we'll do the rest.